Despite the anti-Gaddafi propaganda in the AP report, the facts are that the tribes are ready to join the battle to drive the western-backed insurgents from their lands and Gaddafi has their full support as Brother Leader. The insurgents rejected the tribal elder’s offer of peace. Now they will face the wrath of the tribes for their crimes against humanity and their atrocities against the Libyan people. 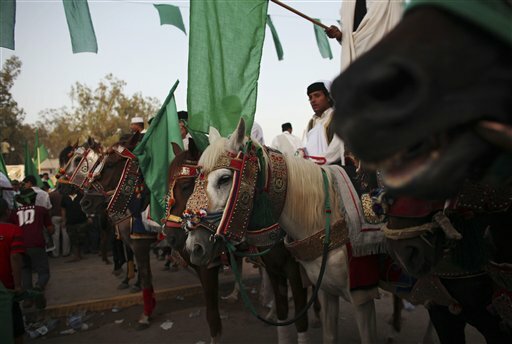 Al-AZIZIYA, Libya — Dozens of horsemen in flowing robes sat on their mounts cheering as men around them fired AK-47s in the air, proclaiming their allegiance to Libyan leader Muammar Gaddafi and their readiness to march on the rebel-held western mountains. The pomp and bravado on display during the rally in the sweltering town square in al-Aziziya south of the capital is part of a concerted effort by Gaddafi to mobilize one of the pillars of his regime — Libya’s tribes — to combat recent rebel advances. It’s not the first time Gaddafi has tried to rally the tribes. Since the Libyan uprising began in mid-February, he has threatened to unleash angry tribesmen on opposition-held towns, although nothing ever materialized. This time, the move appears aimed at countering the rebels’ recent diplomatic and battlefield momentum in the nearby mountains. Last week, more than 30 nations including the United States gave the rebels a boost by recognizing their National Transitional Council as the country’s legitimate government, potentially freeing up billions of dollars in urgently needed cash. And on Libyan soil, Arab and Berber rebels have driven Gaddafi’s forces out of much of the Nafusa mountains, forming a third front against Tripoli. In the first week of July, when the rebels took the town of Qawalish, they were within 100 miles (160 kilometers) of Tripoli, although their advance has since stalled. Over the past week, Gaddafi has started injecting more and more references to the tribes in his almost daily speeches and begun talking about a popular march of “millions” of tribesmen to reclaim the lost territory. Sometimes it is an unarmed march of men, women and children, other times it sounds like more of a military operation, but at the very least it suggests some kind of counterattack may be in the offing. It is impossible to determine independently whether the tribesmen truly support the Gaddafi military, as the government repeatedly insists, or whether they are ready to mount an assault on the mountains. The rebels dismiss the campaign as little more than propaganda. Libya, a vast arid country of mostly desert and just 6 million people, has always been a deeply tribal society and Gaddafi’s rule of permanent revolution, which disdained ordinary government institutions, often came to rely on the tribes to control the country. In the past week, the government has staged a series of rallies in towns near the mountains featuring thousands of cheering supporters, many holding the banners identifying themselves as part of tribes such as the million-strong Warfala. Gaddafi himself is part of the small Gadhdhafa tribe based in Sirte in the center of the country. In Zawiya, a town once held by rebels, Gaddafi started his speech Saturday with a nod to each of the tribes represented there before urging them to march on the mountains. Just in the past two days, Libyan mobile phones have been deluged by text messages announcing the readiness of various tribes to attack the mountains — even though text messaging service is normally disabled in the country. “The tribes of Ghariba region will march in the millions to cleanse the western mountains,” said one text. “The tribes of Gharyan, Asaba and Qawalish announce their support for the popular march to liberate the cities villages and countryside of the western mountains,” said another, referring to towns on the edge of the mountains outside rebel control. Government spokesman Moussa Ibrahim has repeatedly dismissed the rebel advances and said the government has now distributed some 1.2 million weapons to the tribes. “The power of the regime in Libya, the power of this dictatorship in Libya, is not the army, like it or hate it, it’s the tribes. Get the lesson,” he said, singling out the support of the Warfala in particular. While there have been some defections from the western tribes, for the most part they appear to be remaining loyal to the government. It was not always this way. When Gaddafi came to power in a 1969 coup, he was a follower of Egyptian President Gamal Abdel Nasser and his ideas of Arab Nationalism and socialism and so tried to suppress tribalism. “He thought it was a force for backwardness,” said Brahimi, the researcher, though within in a few years he had to turn back to the tribes to bolster his rule. Gaddafi’s heavy emphasis on tribalism is even more stark compared with how the rebels have attempted to go in the opposite direction. In the early days of the rebellion in the east after government troops were driven out, the rebels immediately raised the slogan of “no to tribalism” in a direct rejection of Gaddafi’s policies.